Upload all the files to the /wp-content/plugins/wp-cookie-user-info. For customizing the plugin’s settings, click on ‘WP Cookie User Info’ menu in WordPress left admin menu. Once you have successfully installed the plugin, check for the WP Cookie User Info on the left admin menu and click on it. Once you click on that menu , you will see the plugin’s landing page with various tabs on the left. Now, you have to click on the menu “WP Cookie User Info” or sub-menu “Cookie Info Manager” which will take you to the tab list page. There you can see the default tab on the list. Now, click on the Add Cookie Info button. This settings allows you to set the display text for your Cookie Notice. There are other cookie notice components to choose from which are “Confirmation button”, “More info button” and “Close button”. You can customize the text the same way for each of them. Confirmation button enables the user to agree or be acknowledged on the use of cookie through our Cookie Notice. Close button has the same behavior as the confirmation button. Here you have option to choose the display type (ie Bar Notification), position of the bar (Top Absolute,Top fixed or Bottom) and five different templates. 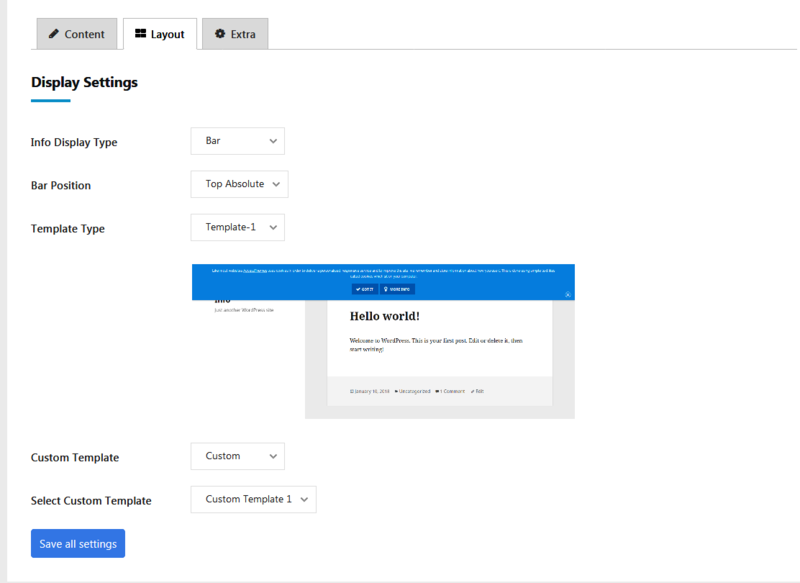 Further, Custom Template Settings or Default Template option is provided. Extra Settings are the list of miscellaneous settings. Users can choose on the occurrence of the cookie notice after a certain period of time. This setting page enables the use of Cookie Notice. Users can enable/disable the Cookie Notice and choose on where it gets displayed, either Home Page or All Pages. Custom Template allows you to include additional display features to the Cookie Notice. A Custom Template is chosen from the Layout Settings .The user can edit the Custom Template from this list. Initially, the list is empty, on Adding a Custom Template. we are redirected to a page to add. Once a Custom Template has been added, it has to be selected in a cookie info setting so as to apply it in the frontend layout. 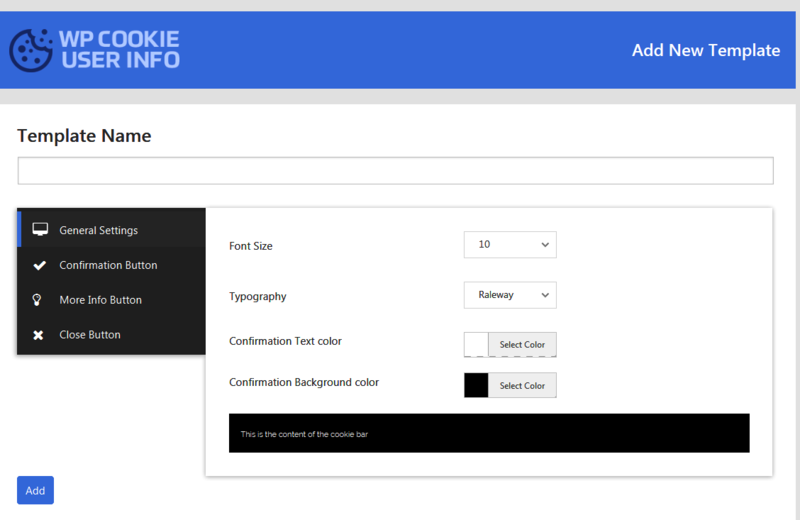 Select the Custom Template from the layout setting tab of the Cookie Info Settings Form. 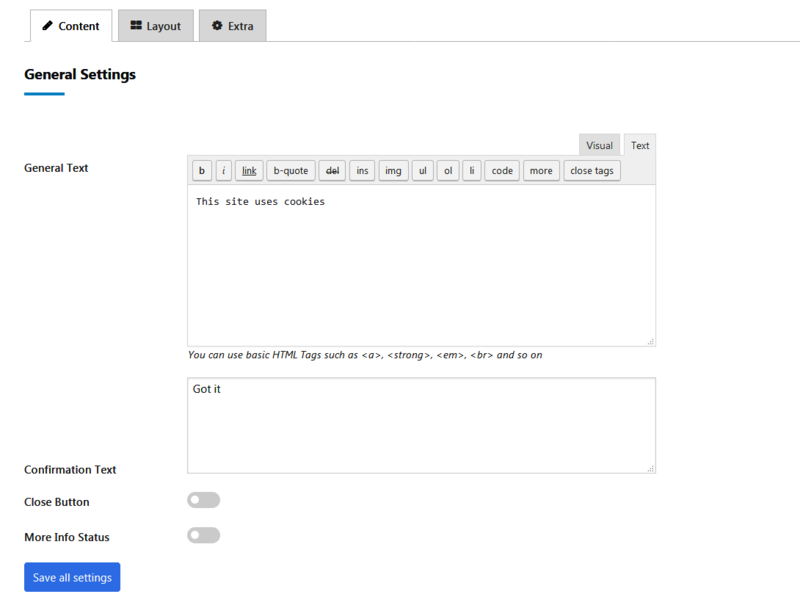 WP Cookie User Info works best with every WordPress theme. It’s even more remarkable when used with popular themes like VMagazine and AccessPress Parallax. Hey Buddy!, I found this information for you: "Cookie Notification Plugin for WordPress – WP Cookie User Info". Here is the website link: https://access-keys.com/documentation/wp-cookie-user-info/. Thank you.